Happy to present this first time trio featuring percussionist constant traveler and master percussionist TATSUYA NAKATANI, guitarist MAKOTO KAWABATA (Acid Mothers Temple, Mainliner, etc) and Austin-based cellist HENNA CHOU (curator & managing director of Church of the Friendly Ghost). Absolutely stunning and incredibly dark/foreboding music recorded Nov 14, 2016 during the Supermoon right here in Austin, TX. 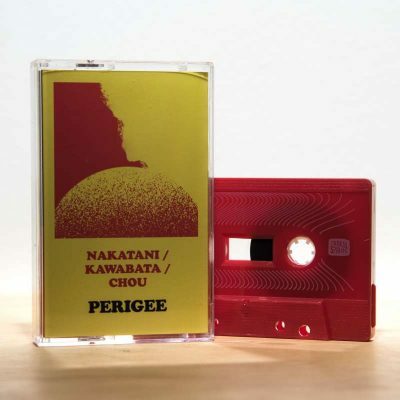 When you take these three accomplished musicians on pedigree alone you might conjure a certain sound or image, but contrary to what I will admit I initially thought it would sound like, Perigee begins cautiously and slowly ebbs and flows throughout these thirteen tracks. The album has an otherworldly feel that reflects all good (supermoon) & bad (the recent election) feelings from that evening in November 2016. Another unique & impressive feature to Perigee is that the thirteen tracks you hear were edited from 3 long takes. Taken out of temporal context, the tracks present snippets of different moods that meld into one another and create an entirely unique narrative from the pure recording. Tracks stop and start without warning, sometimes reminding you of an earlier track or jarring your thought patterns as you listen. Perigee is an absolutely unexpected & absolutely stunning album from this first (and hopefully not the last) meeting of Nakatani, Kawabata & Chou.